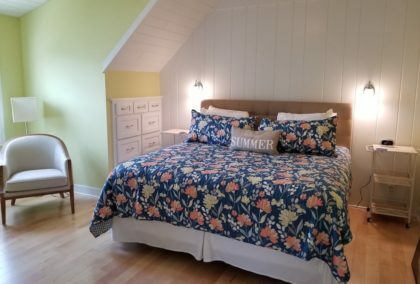 The Nantucket unit accommodates up to 5 guests. 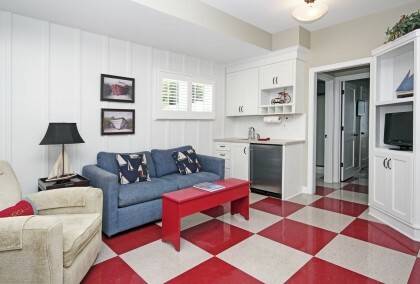 1 bedroom, 1 full bath, 1 queen sleeper sofa, 1 twin sleeper sofa and a fully equipped kitchen. Also ask about our Charleston one-bedroom lock-off available in the off-season. The Hampton and Newport units accommodate up to 8 guests. 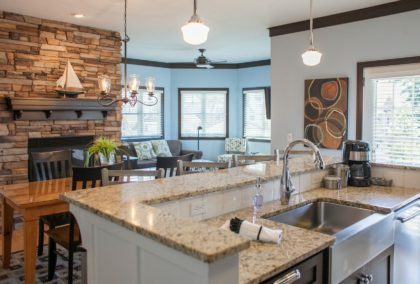 2 bedrooms, 2 1/2 baths, 2 queen sleeper sofas, and a fully equipped kitchen. The Savannah and Bridgeport units accommodate up to 8 guests with the loft offering additional flexibility with sleeping arrangements. 2 bedrooms, 1 sleeping loft, 2 1/2 baths, 2 queen sleeper sofas, a fully equipped kitchen, and first level wet bar. 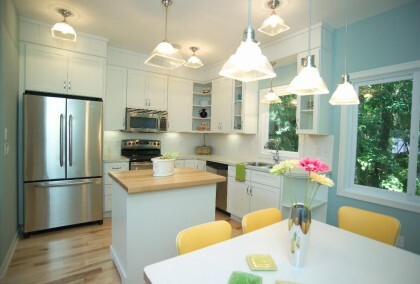 The Marblehead and Charleston accommodate up to 10 guests: 3 bedrooms, 3 1/2 baths, 2 qn. 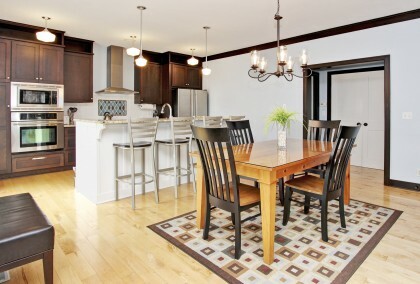 sleeper sofas, a fully equipped kitchen, and first level kitchenette. The 3 bdr. 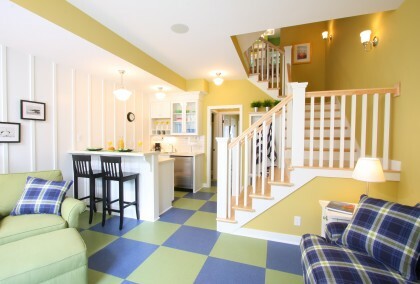 Nantucket accommodates up to 11 guests: 3 bedrooms, 2 baths, 2 qn. sleeper sofas, 1 twin sleeper, a fully equipped kitchen, and first level kitchenette. The 5 bedroom Nantucket is our newest ,largest,and most versatile unit ,featuring 5 private bedrooms, 2 living areas for sleeping , 3 bathrooms, and sleeping capabilities for up to 16 people! Each of the 3 floors may be closed off which allows for more options for shared and private living configurations. Newly remodeled 3-story unit offers amazing panoramic views from the 3-level turret and flexible sleeping arrangements for 2-16 people. The Nantucket is a unique space, in that it allows for guests to use each floor in a way that best suits their group and situation. Introducing the new Two-Year Float Ownership Option! You’ve asked and we’ve listened! Enjoy 5 weeks in your luxury vacation home spread over a two-year calendar. Starting at $34,600 in the Hampton. All of the same amazing Benefits of Ownership apply. Click Here to learn more! The Beach House offers an added bonus to your seasonal vacation: 4 rounds of golf per day at the beautiful Macatawa Legends Golf and Country Club. Enjoy the club’s pools, tennis facility and workout rooms as well. All Beach House guests also enjoy a discount at any of their restaurants! For additional information or help booking your stay, Contact us or call Lisa at 616-886-9243.